When my maternal grandmother, Dora, was a child, she came to America from a tiny village in Eastern Europe. 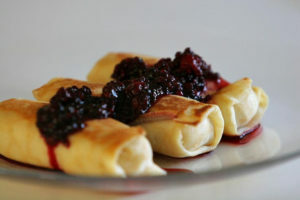 One of my fondest memories of her was that she made amazing blintzes, thin crepe-like pancakes filled with savory cheese. When I was a little boy I’d visit her in the Bronx in New York City, and we’d walk together to the store, my small hand in hers, to get fresh ingredients. Then we’d go back to her apartment and I’d watch her make my beloved blintzes. She never followed a recipe. Everything she made was by eye or by heart. The best part of all was eating them. My grandmother was a cheek pincher who loved me with food. And her food, from blintzes to chicken soup to chopped liver, was extraordinary. By contrast, I hadn’t felt as close to my mother. While my dad and I shared jokes and a common interest in music, when I was in my pre-teen years, I decided that my mother was stoic, cold, and unable to connect with me emotionally. We didn’t spend much time talking and I didn’t enjoy her cooking. Eventually I decided that I no longer wanted to be associated with the people in my mother’s family: Eastern European Jews. Their heritage, religion, language, customs, and even their food, including my formerly beloved blintzes, had become embarrassing to me. I conveniently forgot about the hard work and sacrifices my family had made to give me the life that I was taking for granted. I forgot how my mother had paid for things – my cello lessons, an expensive private college, and financial support she gave me when I was having some significant personal struggles – not to mention unwavering moral support. When I started to participate in Instantaneous Transformation seminars with Ariel and Shya, I saw that I had preconceived notions of my mother. I didn’t see her as she was. I saw her as I thought she was. That’s not the same thing. My thoughts about her were colored by a filter, put in place by my disgruntled teenage self who’d been insecure and desperate to fit in. Once I saw this important distinction, I was able to truly listen to what Mom had to say and to see things from her perspective. I saw her loving nature and acts, both past and present, because they were no longer at odds with my own very strong point of view. I was suddenly able to remember the hugs as well as the cream cheese and jelly sandwiches with no crusts. I even remembered when I went through my “purple phase” and Mom knitted me a purple sweater. It was well made, but in retrospect it wasn’t a great color decision for me. As a result of my new perspective, our relationship became closer and sweeter. My grandma Dora is long gone. My mother is ninety-one and her health and memory are fading. She’s confined to a wheelchair and although her long-term memory is generally good, her short-term memory is nonexistent. She remembers my Dad, but not that he’s been dead for twenty years. I recently went down to Florida to visit her. At first she thought I was a doctor, which was not a total loss. I’m a lawyer and a literary agent, but she had dreamt of my becoming a doctor, and to her I was. She told me she’d enjoyed my comedy show the night before (I was a standup comedian several years ago) although she felt I went on a little too long. Of course there was no show, but she was happy, especially that she’d stayed at my friend Oprah’s apartment. I was pleased to learn that I am close friends with Oprah Winfrey. I wasn’t upset with Mom’s confusion. As long as she wasn’t depressed or scared, I rolled with it, going along with her reality. But she wasn’t eating and her nurses and aides were concerned. An additional benefit of my participating in the Kanes’ seminars is that I’ve become very intuitive. More accurately, I’ve allowed my intuition to override what used to be my denial and doubt. I knew in my gut that blintzes would reignite my mother’s appetite. I asked the medical professionals if there were concerns about fat, salt or any other nutritional caveats. They said my mother needed calories and, at this point, any were good. I went to a deli near my mom’s house and on the way home, my car was filled with the familiar aroma of blintzes and matzo ball soup. Images of my grandmother’s smile went through my mind. I heard the roar of the crowd at Yankee stadium as we walked through her Bronx neighborhood. Most importantly, I felt the lineage of love that traveled from Dora through my mother to me. Unexpected tears welled up as I drove the Florida roads, far from New York City. I was grateful I could allow myself the pleasure of those tears, the welling of love and affection. When my mother devoured two blintzes and smiled at me, my chest swelled with gratitude for Instantaneous Transformation. My heritage is rich and full of love and life. In that moment, I rediscovered that life is in the blintzes. This is an excerpt from Being Here…Too, which is available wherever books are sold as of November 12, 2018. Since 1987, internationally acclaimed authors, seminar leaders, radio show hosts and business consultants Ariel and Shya Kane have acted as guides, leading people through the swamp of the mind into the clarity and brilliance of the moment. Find out more about the Kanes, their seminars in NYC, Germany and Costa Rica, the Say YES to Your Life! Meetups their work has inspired, their Being Here radio show or join their email newsletter. Also get information about their award-winning books.